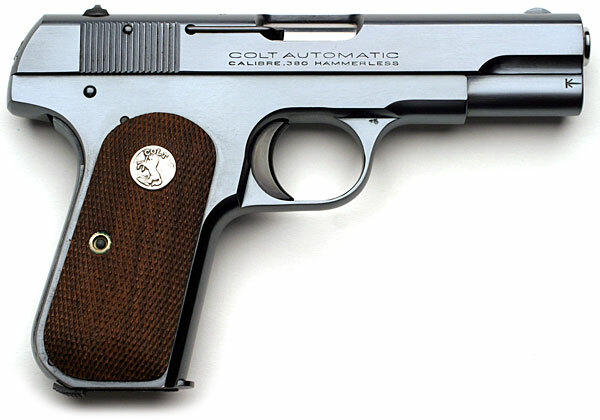 Colt Model 1908 Pocket Hammerless .380 ACP Serial Number 103691 Type IV (left side) (ca. 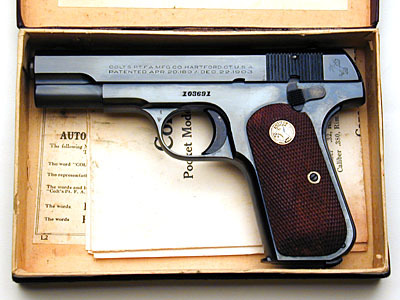 1929) - integrated barrel bushing, 3 3/4" barrel, and magazine safety. 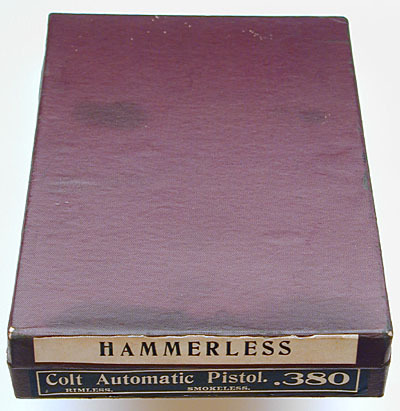 (.32 sn range 468001 - 562000) (.380 sn range 93001 - 136000) This example is a commercial Type IV .380 variation with blued finish and machine checkered walnut grips with flush Colt grip medallions in as-new condition with the original box numbered to the gun. Any discoloration of the above photo is due to the presence of oil on the gun. Original box for Model M .380 pictured above. Condition of this box is excellent with all corners intact, excellent paper covering and complete end labels. Hand-written serial number on the bottom label-end of the box. This was done in the shipping room to make it easier to record the guns in the shipping ledgers at Colt when filling an order. Model M .380 pictured in original box with instructions. 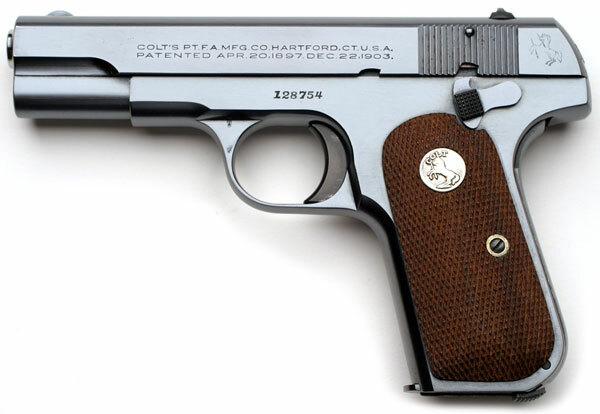 Colt Model 1908 Pocket Hammerless .380 ACP Serial Number 128754 Type IV (left side) (ca. 1938) - integrated barrel bushing, 3 3/4" barrel, and magazine safety. 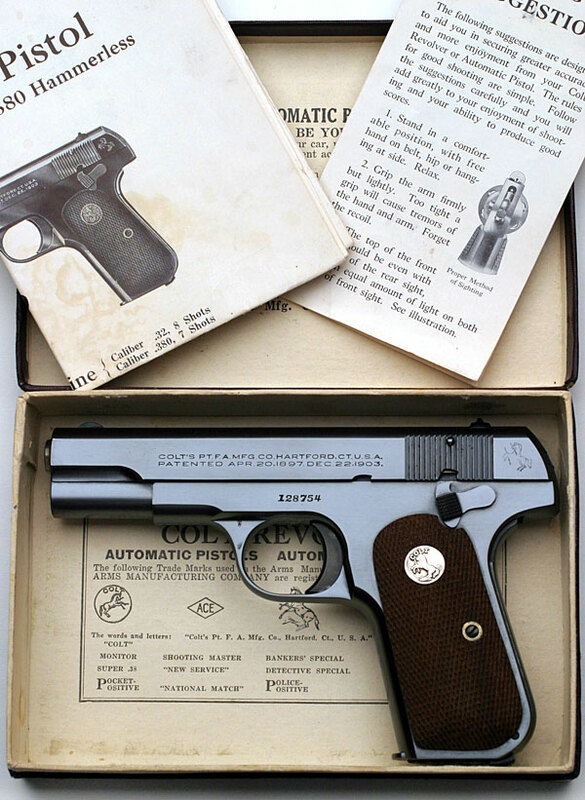 This example is a commercial Type IV .380 variation with blued finish and machine checkered walnut grips with flush Colt grip medallions in as-new condition with the original box numbered to the gun. 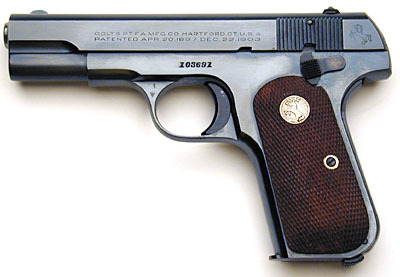 Pistol was one of two shipped to Keith Simmons & Company, Nashville, Tennessee on April 12, 1938.